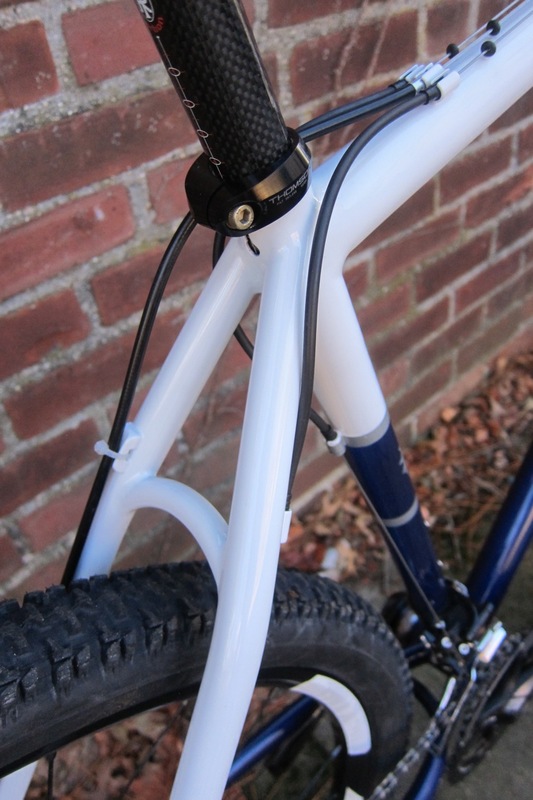 I am not normally the mountain bike builder here at Circle A but I was more than happy to take this one on for Jared as I’ve built him a bike before. 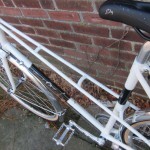 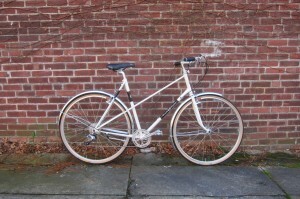 And I also just built a mixte for his wife Sara. 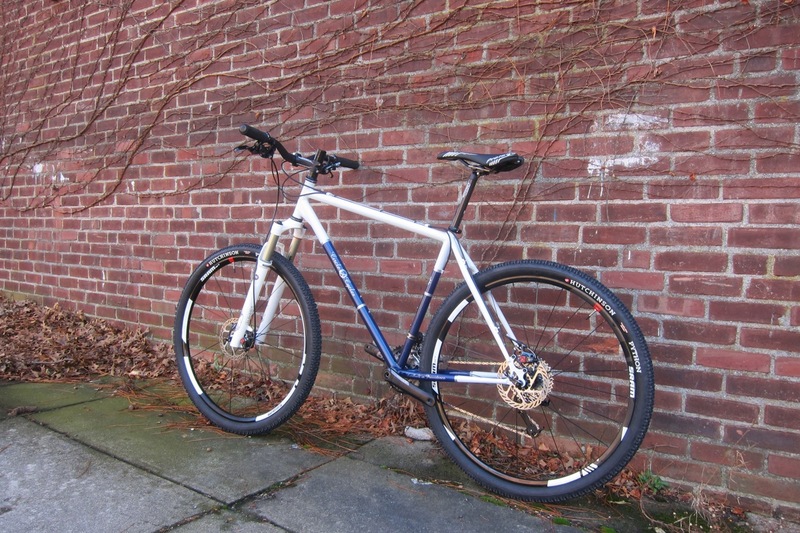 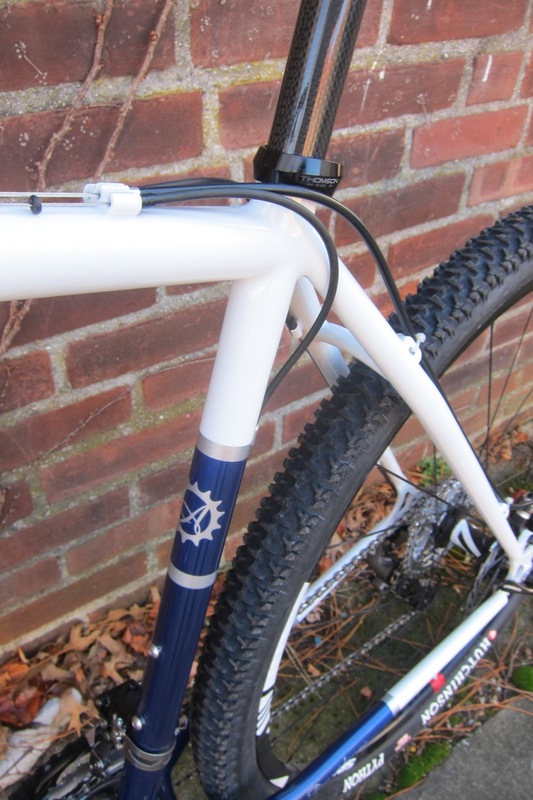 This big hardtail 29er is the polar opposite of that mixte. 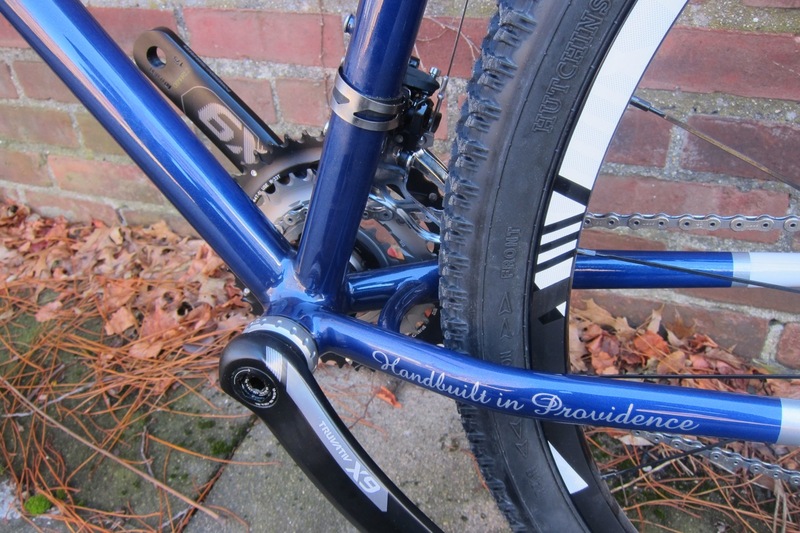 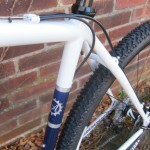 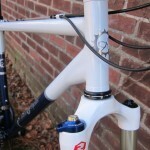 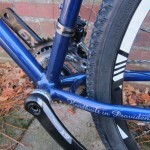 It was built up with a SRAM X9 group and a Rock Shox Reba RLT fork. 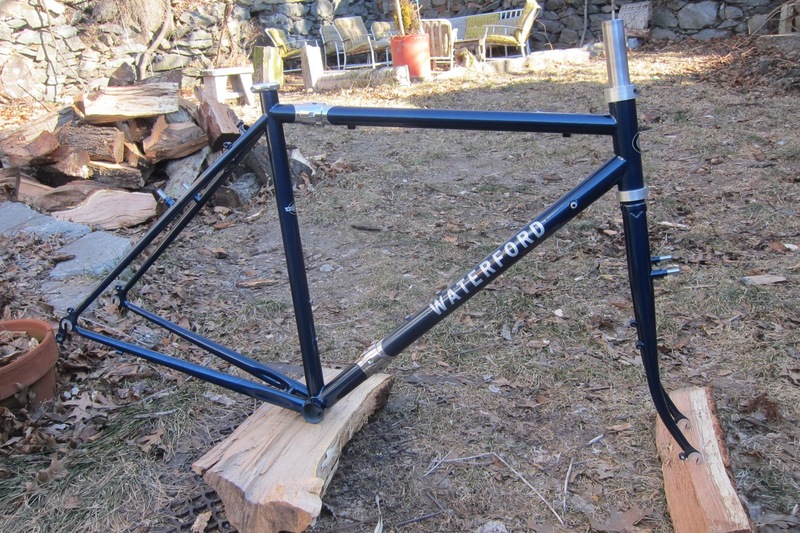 It’s ready for some roots and mud in the great white north! 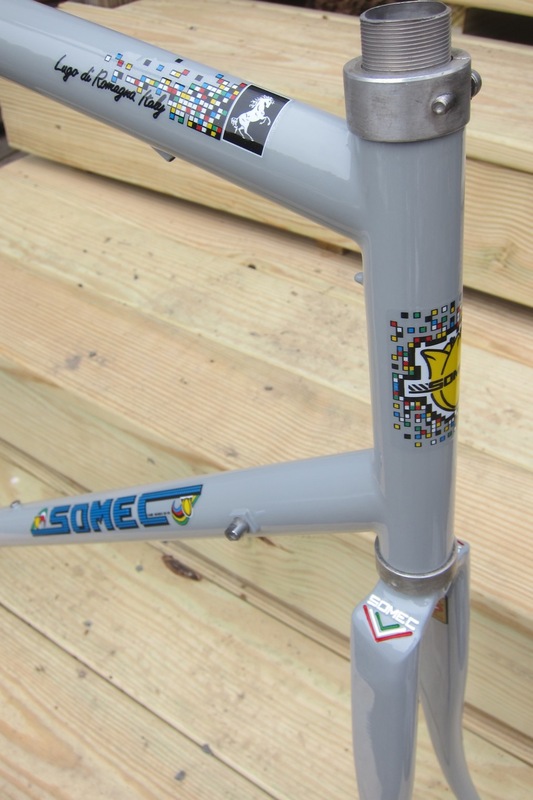 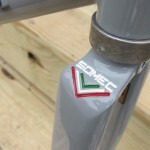 This Somec Promax frameset came to us from overseas for a repaint. 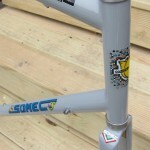 There were also alignment issues with the frame. 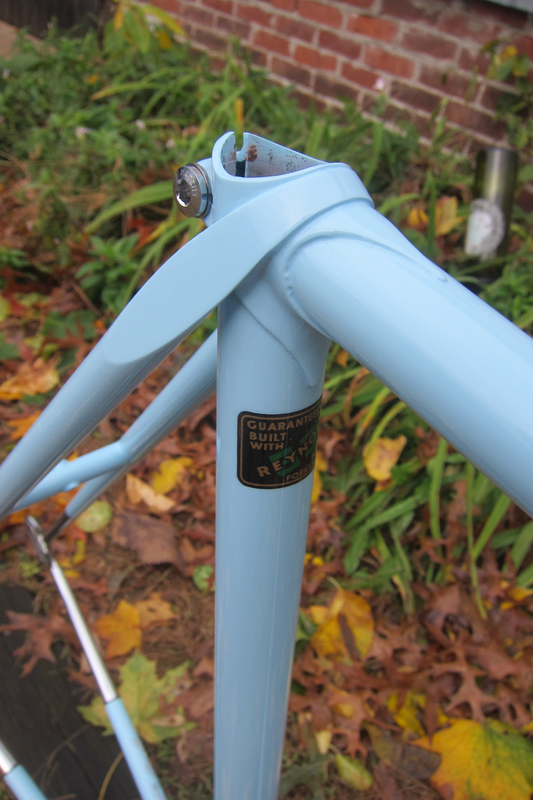 Aligning any imperfections in a Columbus Max frame is pretty tough. 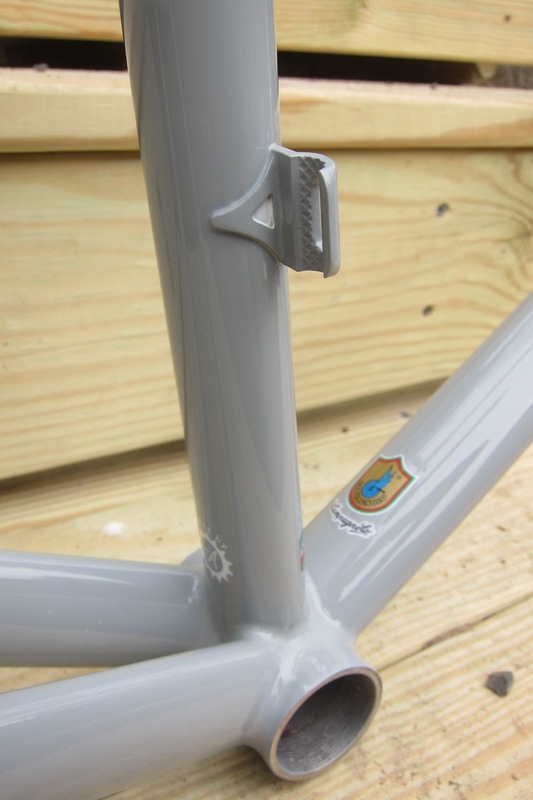 But with enough coercion the frame was straightened and repainted the specified Sport Classic Grau. 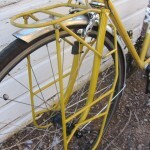 I had made a unique low rider rack for our friend Benno some time ago. 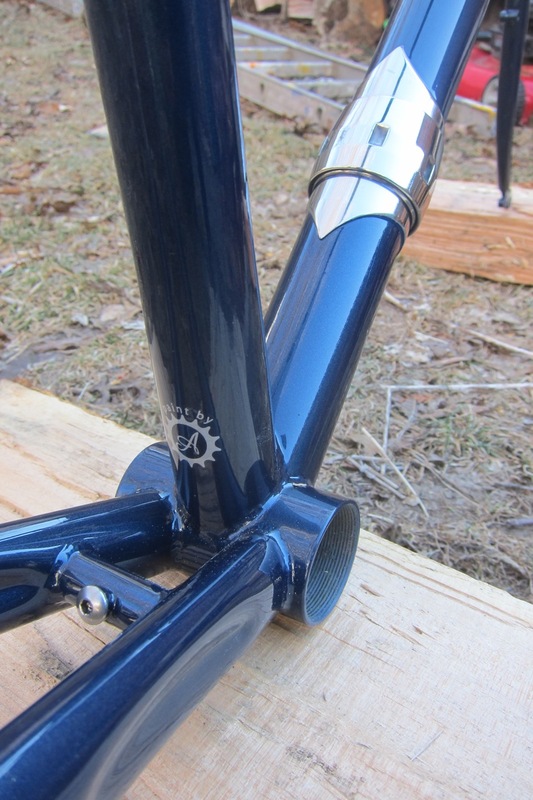 This time, our friend Ken was looking for something similar for his Circle A. I built the same rack but added a small strut from the rear for stability. 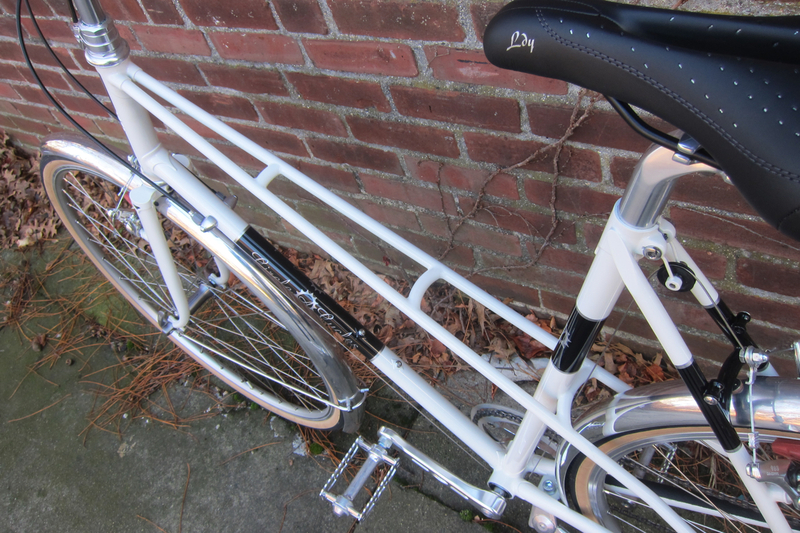 We’ll definitely be testing this out on some short tours this spring! 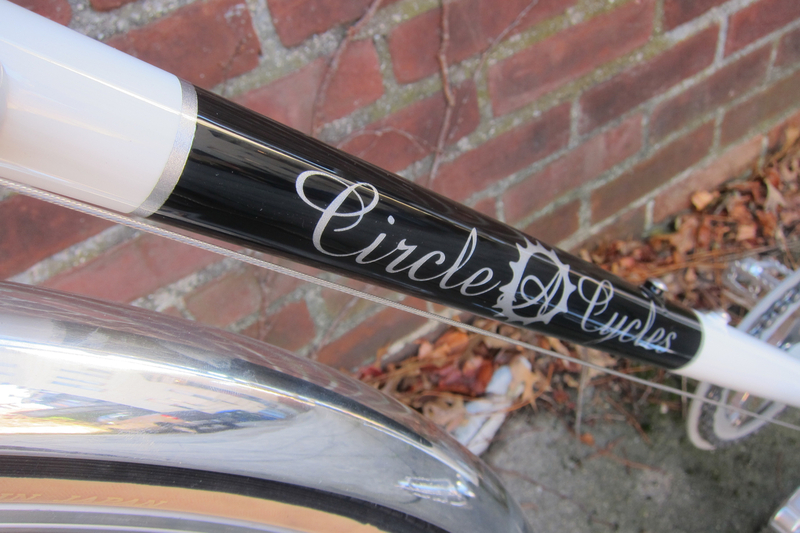 And Francine had me repaint her S&S coupled Waterford. 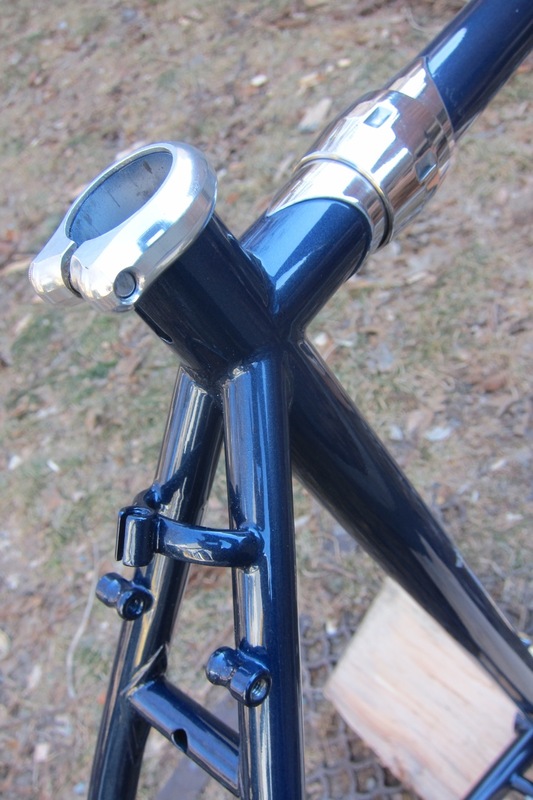 This unassuming dark blue definitely makes the silver couplers and components pop. 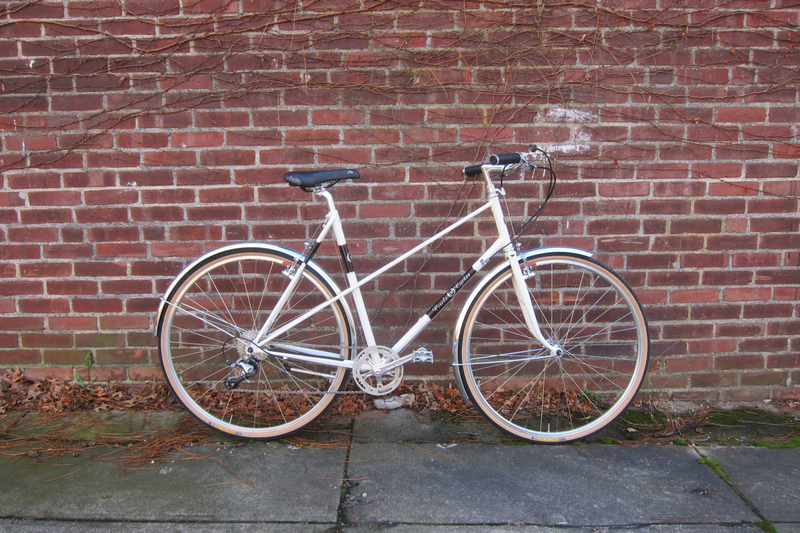 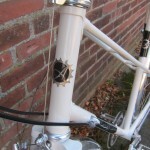 This mixte is now in Canada waiting for the spring thaw (maybe summer?) 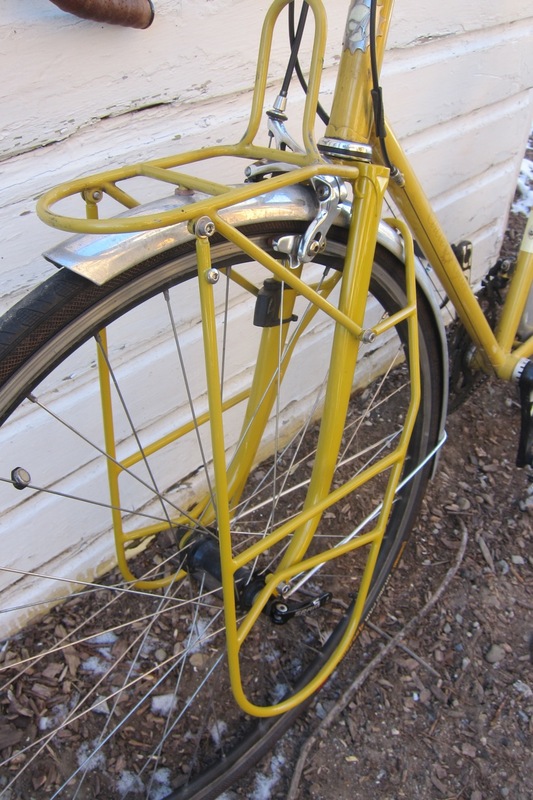 so it can be pedaled around the streets of Edmonton. 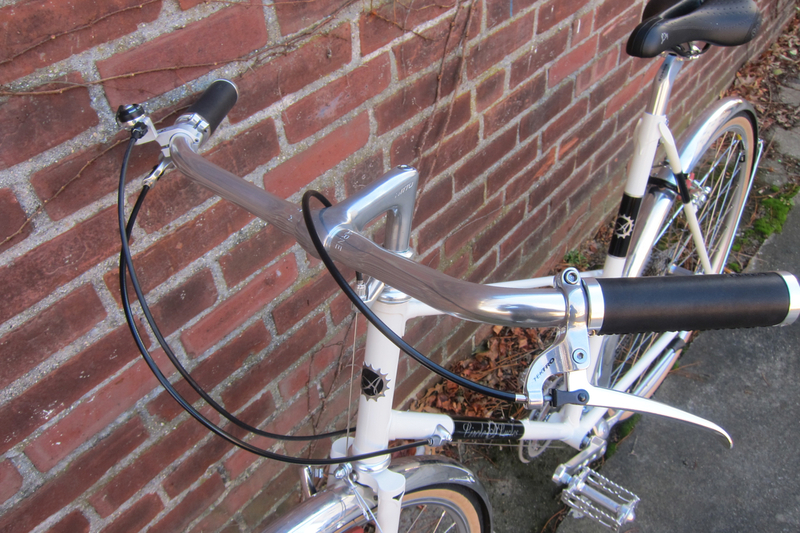 This was my first foray into the use of the Berceau mixte stamped lug set. 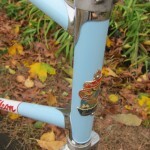 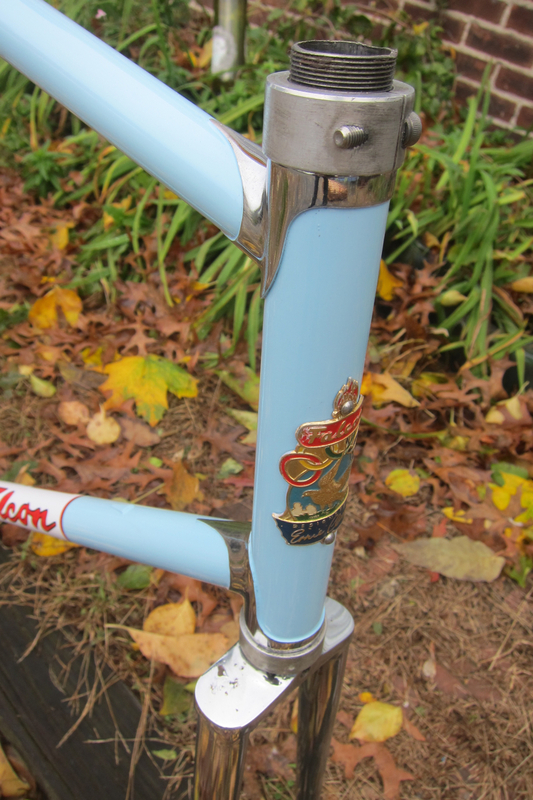 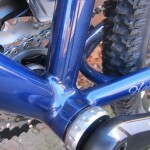 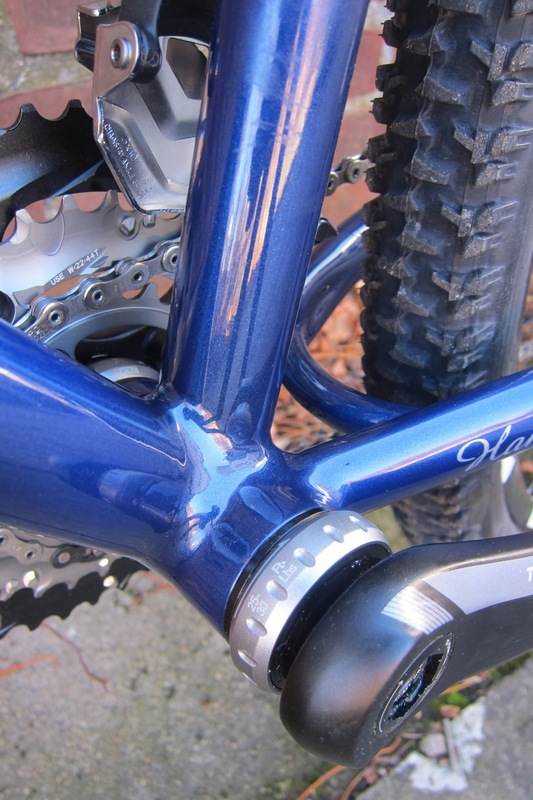 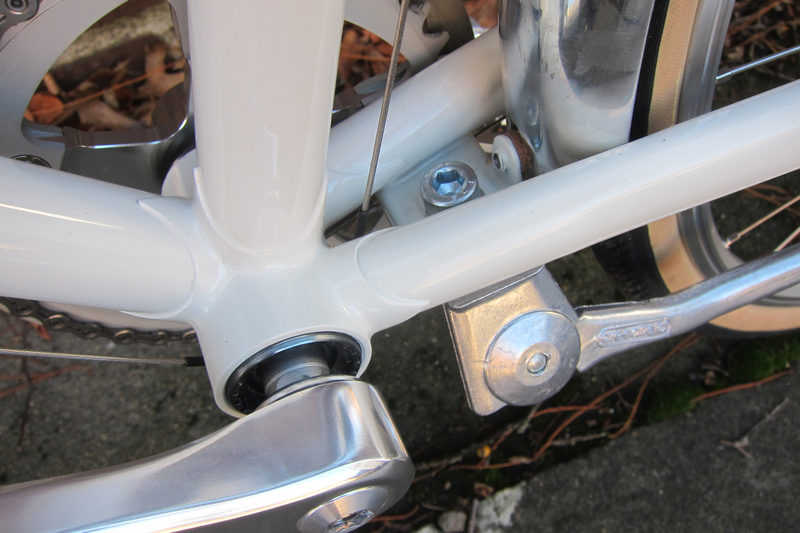 It made me very appreciative of modern cast lugs. 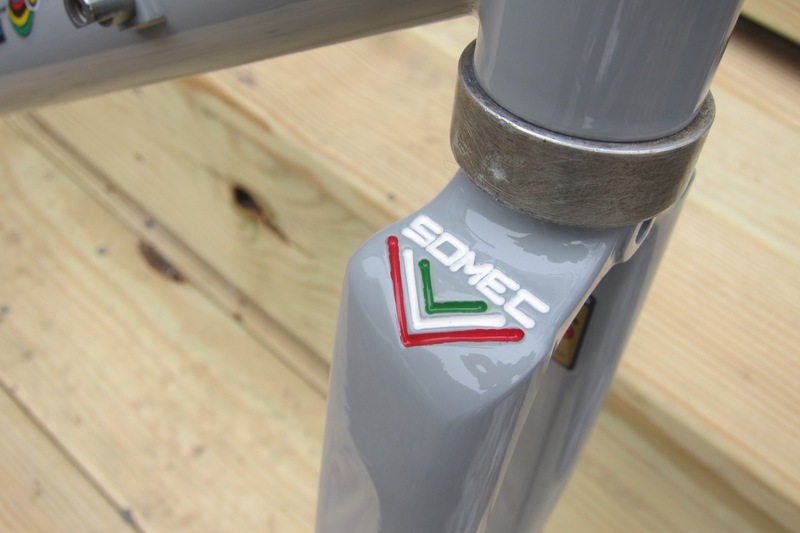 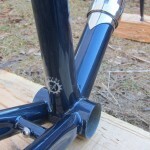 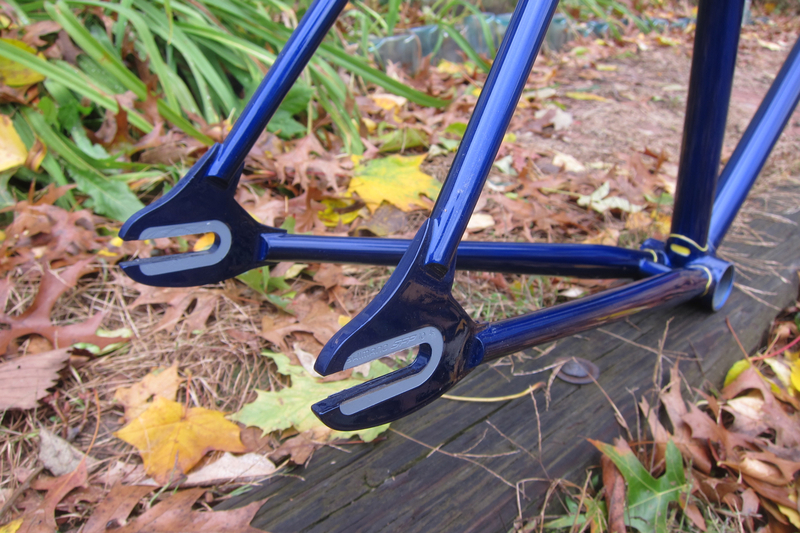 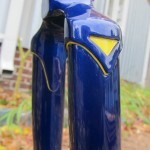 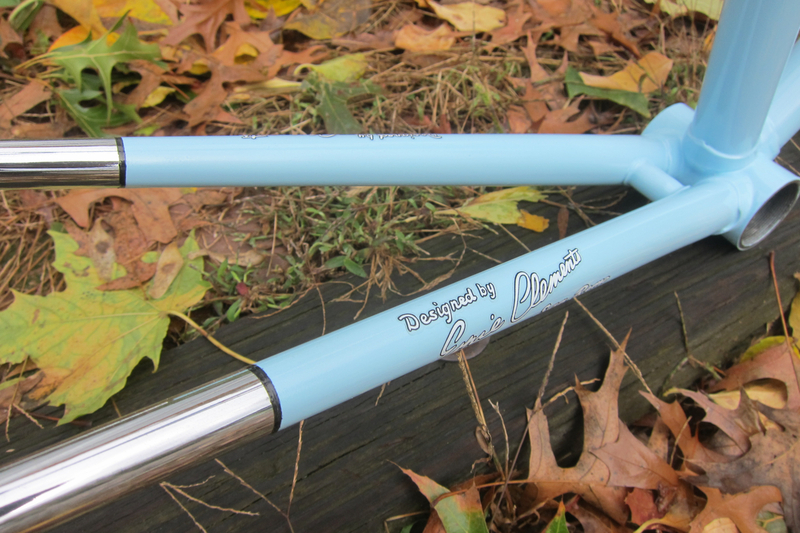 I opted not to use the seat tube/lateral stay stamped piece as it didn’t fit the look of the bike. 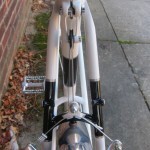 Rather I made a curved bridge to match the ones ahead of it between the lateral stays. 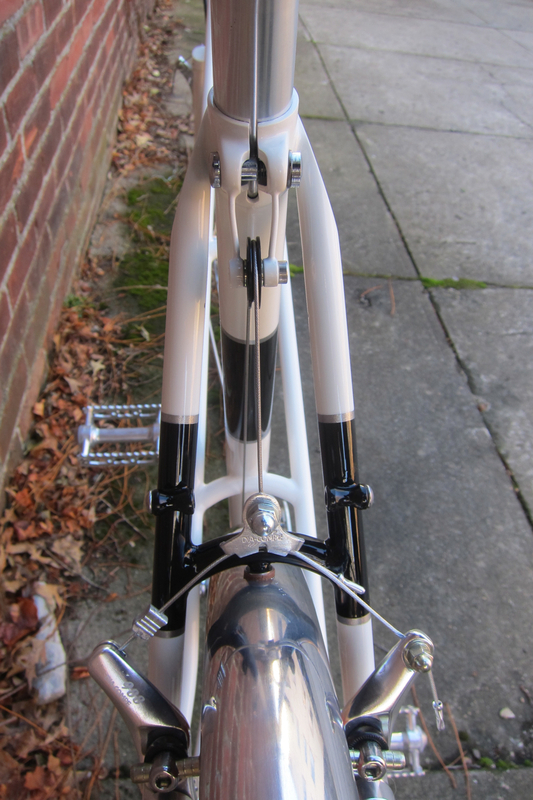 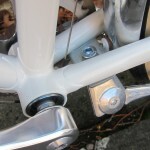 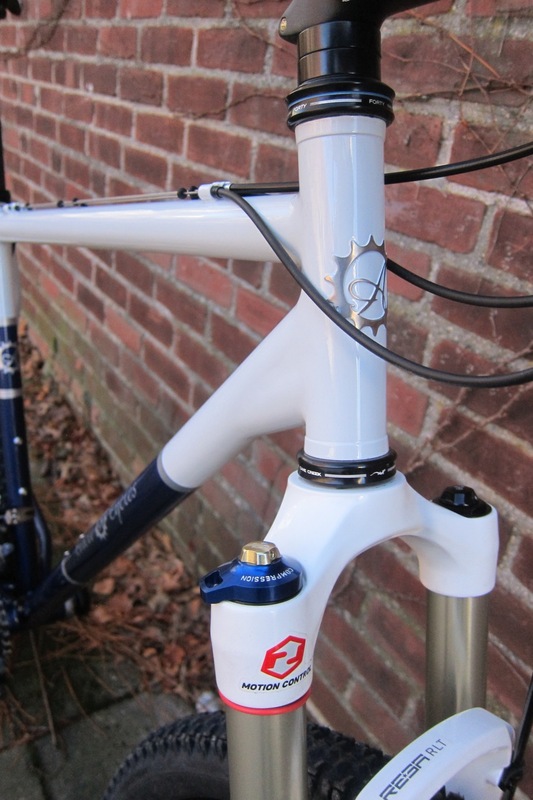 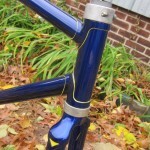 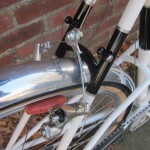 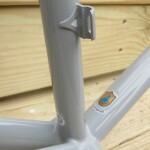 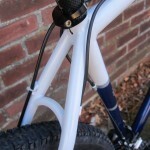 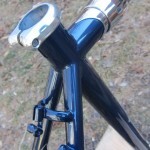 The back brake runs along the down tube to create symmetry with the rear shifter cable. 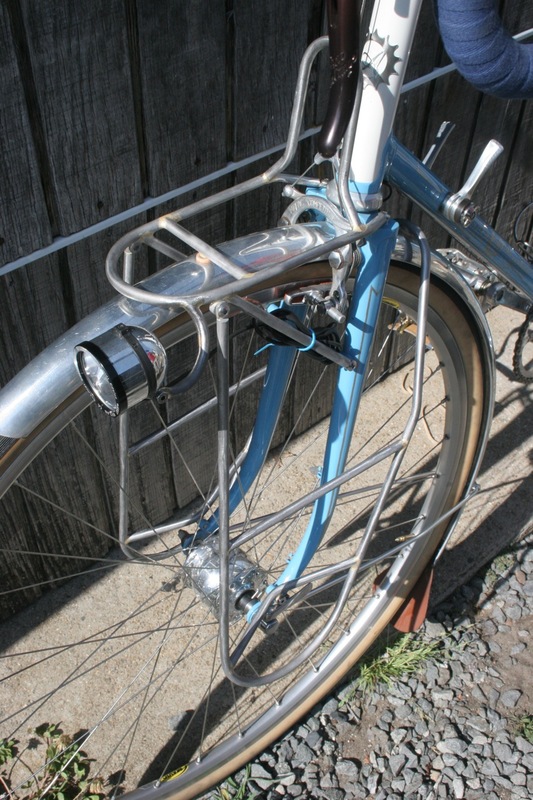 The brake cable then runs over a pulley off of the seat binder. 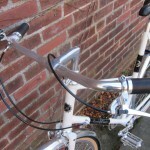 Another part to be noted is the kickstand (though I still leaned it against a wall). 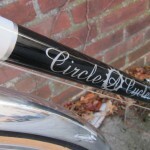 This is the first Circle A with one! 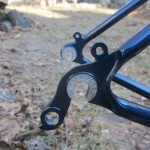 Thanks to Mike Flanigan of A.N.T. 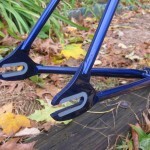 for supplying the kickstand plate. 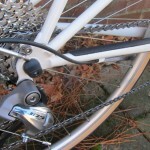 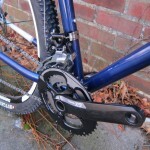 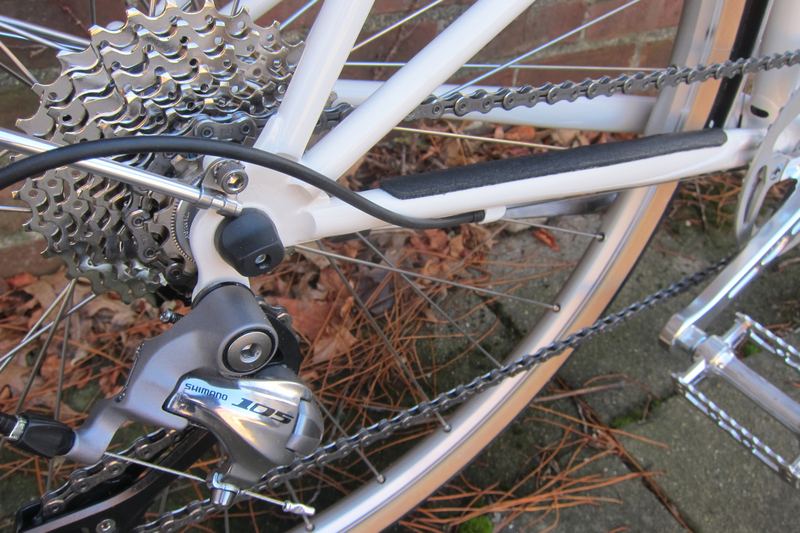 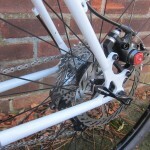 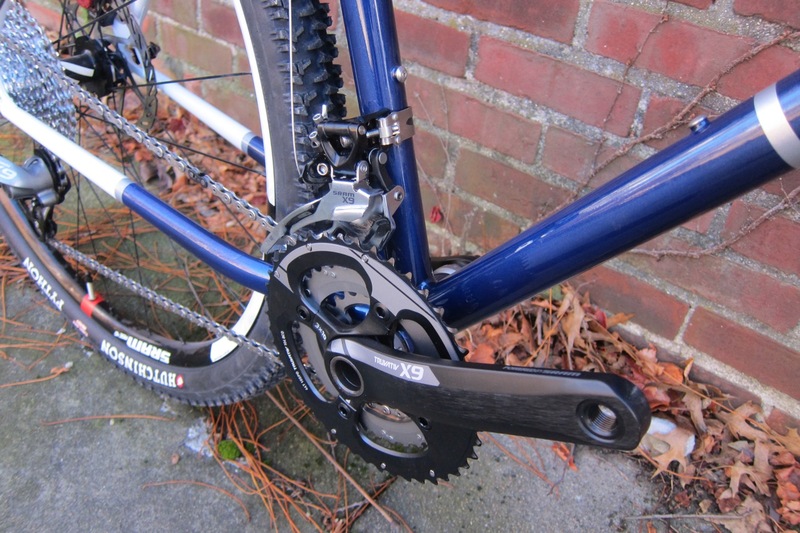 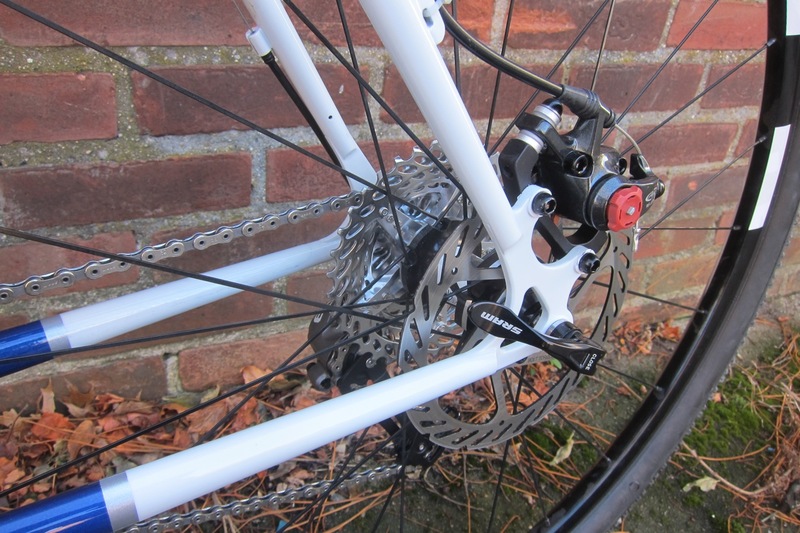 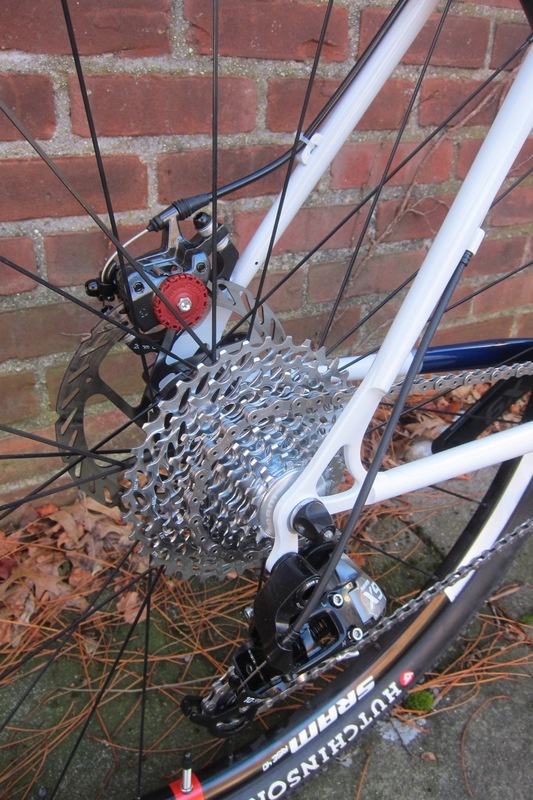 The drive train is a Shimano 105 1×10 making it a pretty simple city bike. 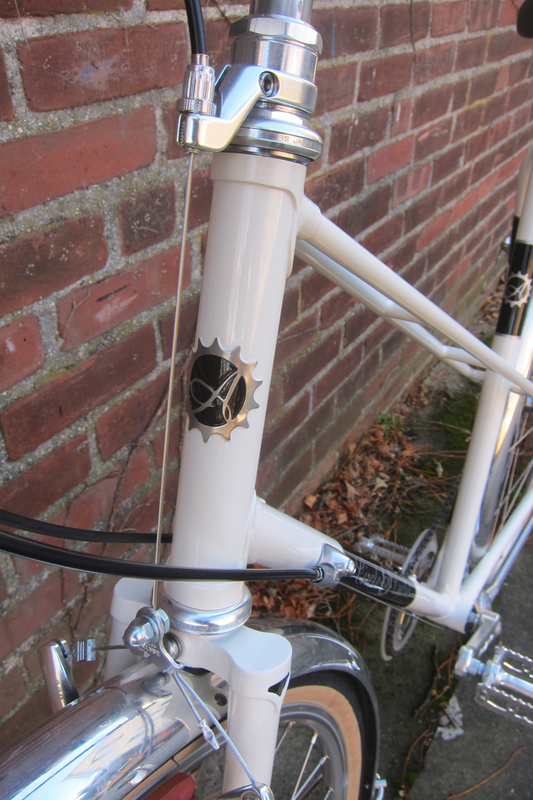 It’s a fun bike indeed! 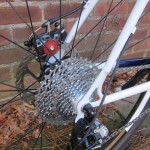 I definitely gave a longer than normal test ride. 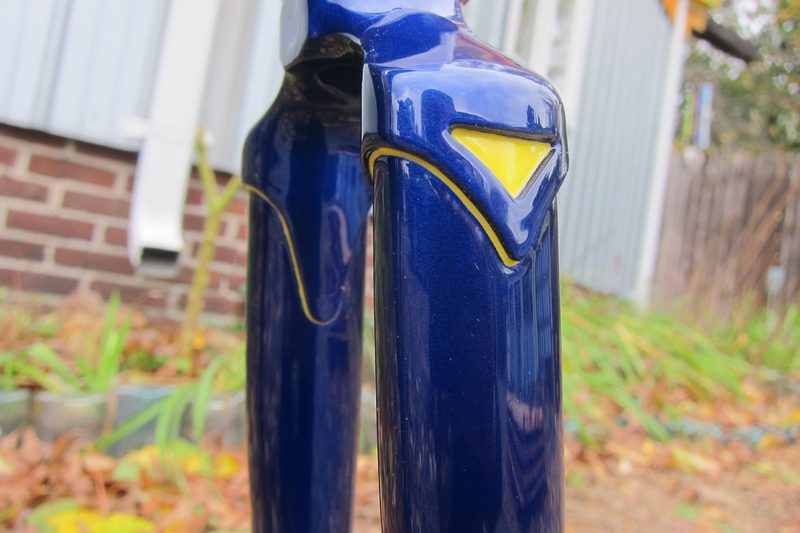 This Falcon came in with a brush paint job that needed to be redone. 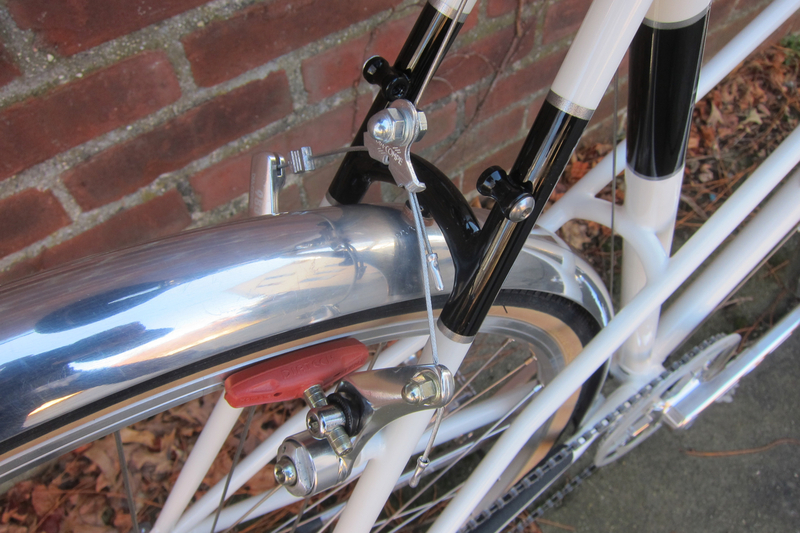 Most of the chrome was still in good condition so it was definitely worth saving. 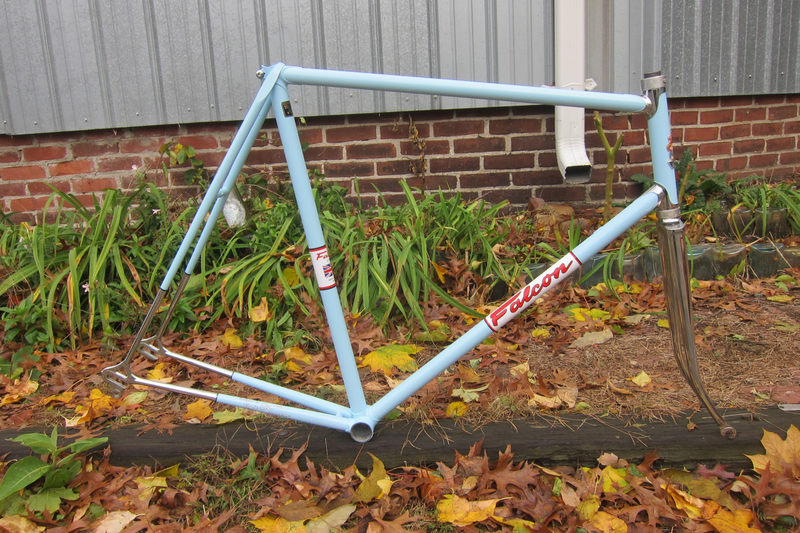 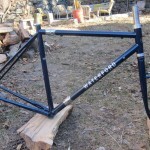 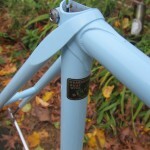 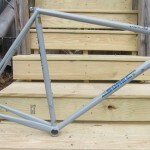 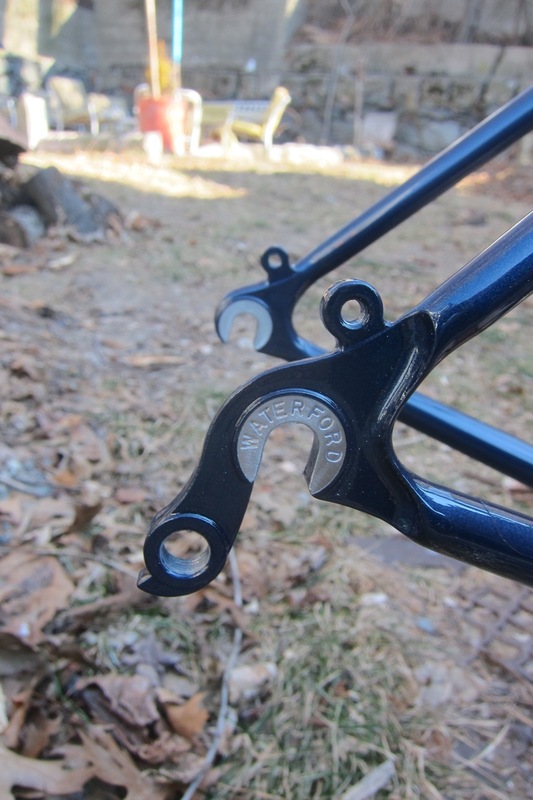 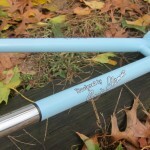 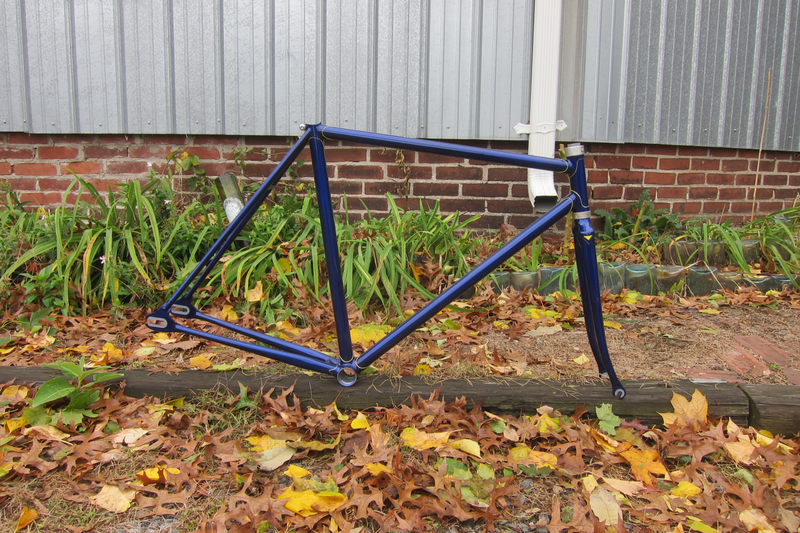 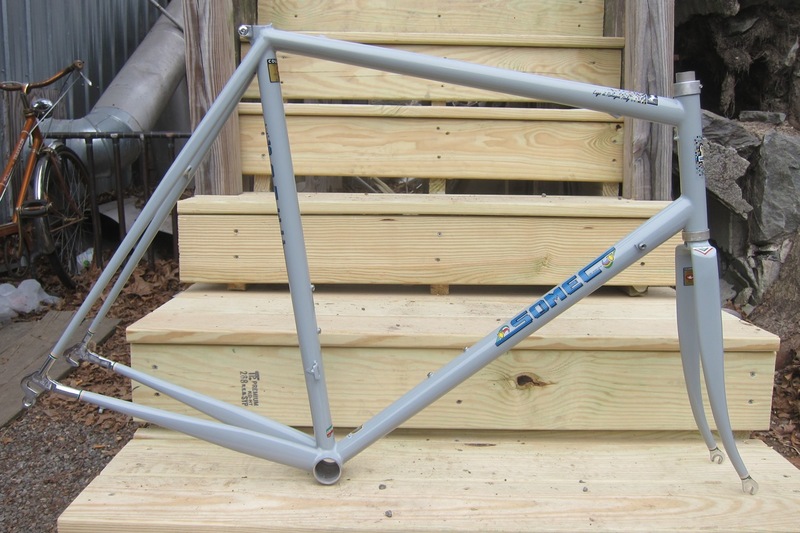 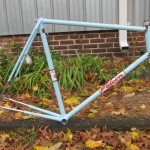 And Rich brought this Serotta track frameset in for refinishing. 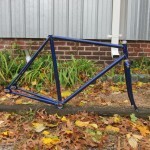 He was looking for a dark blue with yellow lug lining. 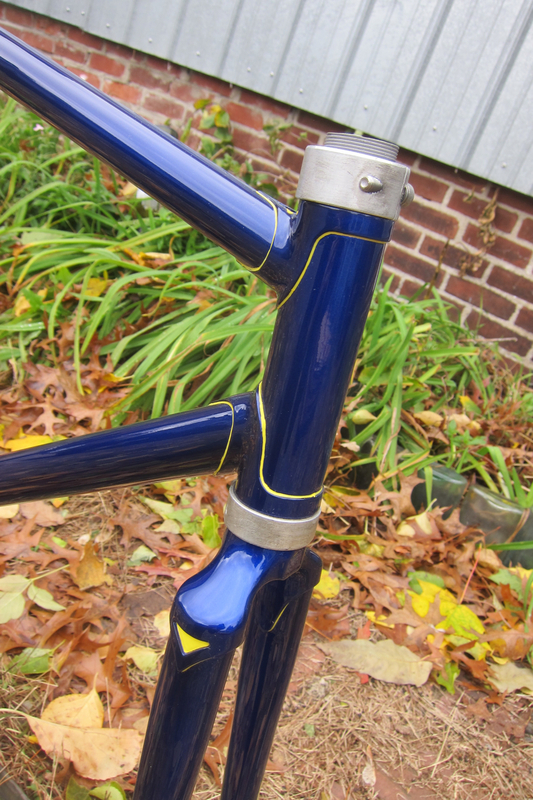 The lug lines were crisp which made for a clean yellow line.